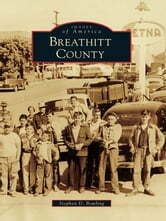 Settled by English and Scotch-Irish descendants who ventured �over the mountains� in search of adventure, land, and fortune, Breathitt County, Kentucky, has produced interesting tales of beauty, progress, intrigue, and murder. �Bloody Breathitt� was the site of a long series of feuds that lasted from the early days of the �Cattle Wars� until the 1970s and beyond. Through the years, the city of Jackson and Breathitt County have experienced booms and busts centered on its natural resources, which included salt, timber, oil, and coal. Since its establishment on April 1, 1839, the county has been a place of educational opportunity through community schools, school districts, Lees College, and a vocational school. From its rugged mountain roots filled with feuds to a community working to embrace new technology and the reemergence of timber and coal industries, Breathitt County has always been in transition, and its continued growth must be grounded in a firm understanding of its past.